Have An Anxious Dog or Cat? Try SensaCalm! Christmas is coming and gift shopping has begun for many. While out picking up gifts for family, don’t forget the pets! They are family, too. If your pet has a tendency to be anxious, how about SensaCalm’s Weighted Lap Pad for your pet? SensaCalm’s Weighted Lap Pads are for human children and adults. However, the company has found that their Lap Pads can be used by dogs and cats as well. According to an interesting article from SensaCalm, “. . . dogs may feel less anxious when exposed to firm, gentle pressure reminiscent of a hug . . . Weighted blankets are weighted, which provides the firm, gentle pressure used in actual deep touch pressure therapy. Also, they don’t attach to the dog’s body, which means the dog is free to move around at any time” (Chambers, 2018, https://www.sensacalm.com/blogs/news/have-an-anxious-pet-how-weighted-blankets-for-dogs-might-help). The Lap Pad measures 12″ x 18″ and weighs 2 pounds. The 2 lb. Lap Pad is what SensaCalm recommends for pets. 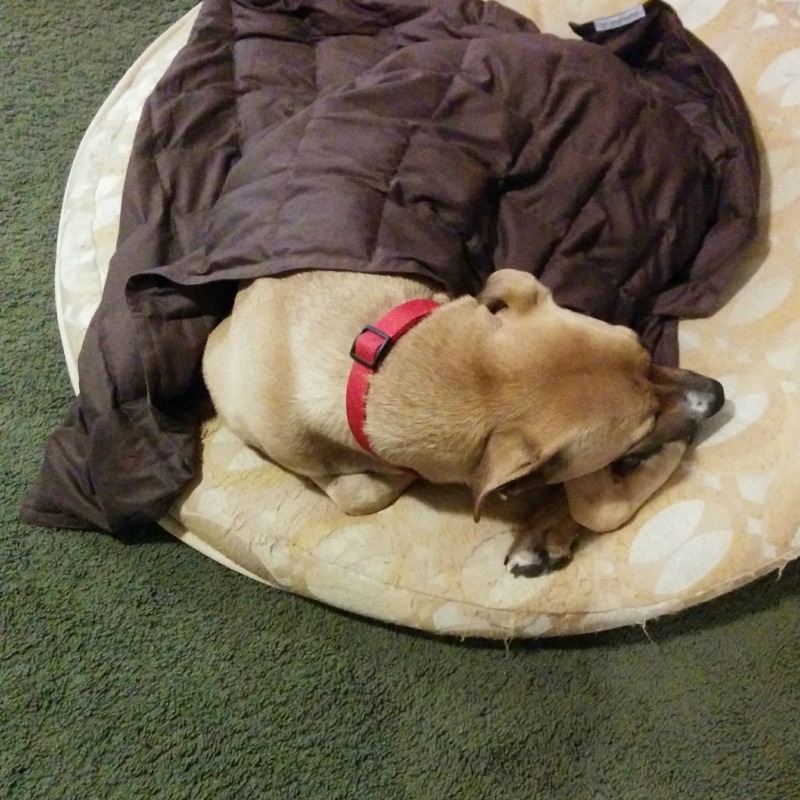 I was sent a SensaCalm Blanket and my dog took to it quite well. My dog is one that gets VERY frightened by thunder. If he hears thunder, this big 70-pound dog will hide under the table for hours (he’ll even avoid going potty all night so that he doesn’t have to go outside). Tonight, he had been hiding under the table because of a storm we had had. I don’t think we had thunder, but he was still a little anxious. Later, he was laying on his bed with his weighted blanket on him, sleeping peacefully. SensaCalm products are weighted, so I would take caution in not using too heavy of an item for your animal. My dog is a big dog and very strong and very able to get out from under the blanket when he wants to. The email I received from SensaCalm recommended the 2 lb Lap Pad for cats and dogs. So, stick to the safer option for your pet and consult with your veterinarian to get the okay about using weighted products for your pet. In fact, I’ll quote and borrow the disclaimer from SensaCalm’s article: “The content (in this post) is not intended as a substitute for medical advice. Talk to your doctor, veterinarian or healthcare provider before undertaking any type of therapy or treatment.” I agree. Safety is of foremost importance. Pets rely on us to take care of them! You can purchase SensaCalm products from their website. Go here to look at their Lap Pads. They have tons of adorable designs to choose from! They even have waterproof ones! And, Merry Christmas to all the pets and their parents!